I just wanted to drop you an email to say thank you so much for all your work on the Pen and Sword Tour. Honestly, you put the travel agents here in Australia to shame - I think they have forgotten how to look after people. I hope to come back to Greece again and believe me if I do, you'll be the first person I contact. I hope you are fit and well! Steph and I just wanted to say a massive thank you for organising and arranging what we had hoped would be a dream holiday and turned out to be even better than that!! As parents of three kids it was brilliant to have everything arranged for us, great hotels and superb food. Every part of the trip was excellent thanks to you! I hear there might be another next year, so hopefully we will be speaking to you soon and seeing you next year. We loved our trip! Everything was very well organized, and we got to see and learn and experience many things about Greece! In addition, when we needed to rearrange things, it was done very easily. We HIGHLY recommend Dolphin Hellas! Generally the agent is very friendly and informative. Very satisfied and sure to ask assistance again. I did everything through the Internet and no problem at all, the pick-up on time, and all as agreed, I really recommend Dolphin Hellas. Dolphin Hellas has always been my first choice in planning our school trips to Greece. Aliki has been extremely helpful all around, and I've been quite pleased with every aspect of what she and the rest of the DH team have handled for us. Our hotels have been very nice, our drivers have always been wonderful, and no pertinent detail has ever been overlooked. I appreciate their professionalism and their friendliness, not to mention their skill at putting together a memorable experience for my students on a fairly tight budget. Highly recommended. Couldn't have asked for better service. We had absolutely no worries, no hitches, perfect service. Felt like royalty. Great service. Efficient, accurate, and accommodating. Great company to work with. Very professional and knowledgeable. Everything was perfect from start to finish. "As an international tour operator of some 40 years standing, I am happy to thoroughly endorse the professionalism of this well respected incoming tourism specialist. Run most competently by Aliki, this family business with over 30 years experience IS the perfect solution to all your inbound tourism requirements in Greece, whether as private individuals or group organisers. Our recent "Greek Portals" tour for 27pax covering Athens/Delphi/Meteora and the islands of Kos/Patmos was in the opinion of the participants amongst the best we have ever run - due in no small part to the high quality of the staff, drivers and guides provided by this agency. Comfortable modern transport with all facilities, a perfect selection of hotels within our budget and domestic flight/ferry tickets plus extra excursions (and private individual add-ons) all booked without any hitches - and all at reasonable and competitive prices. What more could one ask? In the current difficult economic climate in Greece, here is a shining example of the kind of private enterprise that "could" restore this once great Nation!" 5 stars ++++. We have been using Dolphin's services every year since 1999. Uli has been fantastic, going to Greece every summer would not be the same without her valuable assistance and super accommodating style. We can not say enough nice things about her! Just a great agency to work with. All emails and questions were promptly answered. Would definitely book again with them when traveling to Greece. We would like to thank you very much for arranging our local tours at Athens during our recently concluded our trip to Greece from Abu Dhabi. Your presence at the first and last days of our tour and arranging the right guides have given us enough comfort in a place which we have visited for the first time. please convey our thanks to the guides Ms Rebekka and Ms Catherine and the Bus Drivers for their excellent execution of their part during our trip. The success of our 3-week Greece trip was the result of the expertise of our travel agent, Uli, at Dolphin Hellas. It was comforting to know that if we had any problems or questions while on our trip that Uli and Dolphin Hellas was there to assist us. If anyone is planning a trip to Greece, you should contact Dolphin Hellas to get the best advice, accommodations, activities and tours. Everything that Dolphin Hellas arranged for us worked out perfectly. Sorry we couldn't upload any of our numerous pictures but apparently our files are too large for this site. Anyways, I cannot speak highly enough of our entire experience in Greece with the assistance of Uli!!! Every single review we read about her before choosing this company was absolutely true! We had very few mishaps, but when we did (ie: ferry cancelled at last minute), we called Uli and she took care of everything. Our main driver while we were in Athens was always on top of things and gave us excellent service. The hotels were all top notch. The 4-day classical trip was fantastic! This trip would not have been the same without your help and we will always give 5 star ratings on any site we visit. Just wish we could share some of our pictures! I checked several Greek travel agencies before my trip and selected yours because of Uli Perschau. She answered all my emails, no matter how trivial my questions were. She gave me information about ferries vs. planes to Skiathos, sent specific information about tours, etc., all well in advance of my trip and before she knew I was going to book with you. Such an asset when booking from a foreign country. She was terrific. We have just returned from our Greek vacation and are still smiling. We can not thank you enough for the incredible job you did shaping our vacation. As I may have told you earlier, I normally like to plan our vacations but this was our first time overseas. I had no previous experience with your ferry system and all of the transfers needed. While I was slightly apprehensive, my fears went away immediately after landing in Athens when we saw our names on a card with a getleman ready to take us to our hotel. We both agreed that the hotels and the areas where we stayed could not have been more perfect. We loved every aspect of our vacation. We are indebted to you. This was without a doubt the best vacation of our lives. It was effortless and each island was beautiful. Thank you so much! We will tell everyone we know about your wonderful service and the Dolphin-Hellas Travel Agency. We had completely wonderful and worry free vacation in Greece. Thank you very much for taking care of our travel arrangements. I have used Dolphin-Hellas on two occasions and have never been disappointed with their excellent service. They always go that extra mile. We returned home on September 4th. It was a wonderful trip and it was certainly enhanced by our Louis Cruise. The transportation you set up was great. He was actually early to pick us up and was very friendly and helpful. Thanks again for all of your help! We had a great time! Your country is beautiful and filled with wonderful, friendly and helpful people. This is a very late note to thank you for helping us book parts of our trip to Greece in May. We thoroughly enjoyed our times in Athens, Naxos and Santorini. The tours that you booked for us in Athens were fantastic, from the walking tours, the Acropolis and the new Museum. All of our ferry trips went smoothly as well. Athens Electra Palace Hotel with its lovely breakfast garden terrace and rooftop pool was perfect, the Iria Beach Art Hotel in Naxos was just right and charming with lovely suites, wonderful staff and comfortable beachfront location and lastly, the Dana Villas in Fira Santorini was breathtaking. Thanks again- hope you are having a good summer season. This is to thank you for the trouble you have taken to organise my trip to Greece. 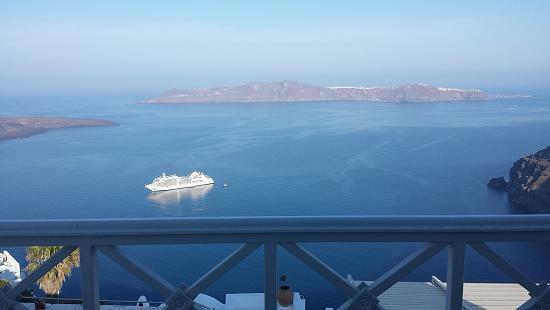 Everything was perfect, the hotel was perfectly placed near Acropolis, the service in the hotel was excellent. Travel arrangements, coach trip, and cruise was all superb and went like clock work. This was our first trip to Greece and we were charmed by the friendly people in Greece. We can not thank you enough for making a flawless arrangement. Thank you again for a most enjoyable holiday. As I had to organise my trip to Greece from Bhutan, email was my only way of communication. Dolphin Hellas was always prompt and helpful. They help me to plan my travel and made all the arrangements of stay, pickup, coach trip and cruise. Our experience of Greece trip was excellent and I can not thank Dolphin Hellas enough for a wonderful holiday in Greece. I'm sorry that a month has passed since our return from Greece and I haven't emailed you to tell you what a fabulous time we had and how wonderful were the travel arrangements you made for us! Hotel Phillipos was such a good choice for us. We got great value for the money and the location was so fantastic! We walked to the foot of the Acropolis the first night we were there and the museum was so close. We also loved being on one end of the Plaka (we spent a lot of time there). All in all, it was a perfect place from which to explore Athens. Louis Cruises was also the perfect choice for us. We got where we wanted to go with a minimum of fuss. We met lots of interesting people from all over the world and the ship's accommodations were quite nice. The staff was excellent and the food was good, too. Hotel Loucas on Santorini was such a surprise! We had no idea what to think when we were dropped in front of a bank and told to wait for a bellboy. By the time we followed him down the winding streets and stairs to the hotel, we were spellbound. Whoever is managing the hotel now is doing a fabulous job. The room was clean and comfortable and the view was amazing. We also dined in their restaurant, Aris, which was the BEST meal we had in Greece! The only thing that might have gone more smoothly was that we didn't have a transfer from the dock at Santorini to our hotel, but a van driver who was transporting two other people to another hotel took pity on us and added us to his van. You were such a joy to work with and did such a fantastic job making our arrangements (even the refund for the canceled shore excursion), we can't say "thank you" enough. We wish you all the best things in life, Uli! I wanted to thank you again for all your help planning and executing our trip to Greece. We had a fantastic time and much of that can be attributed to your assistance. Your recommendations on which islands to visit provided us the opportunity to experience the variety of the islands and your hotel recommendations were great.